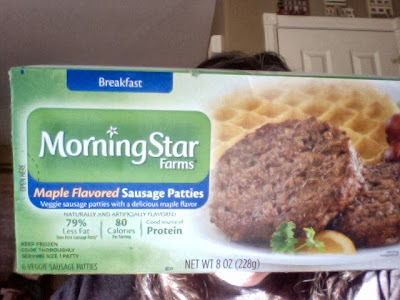 So here's my first vegetarian product review. One of the things I crave for breakfast is a breakfast sandwich. I used to make them with a fried egg, ham or a sausage patty, cheese and an English muffin. Since I'm trying to cut out cheese and eggs, I've been looking around for some vegan substitutes for any or all of those things. These aren't really vegan, because they contain some egg white, but I'm doing this gradually, so that doesn't really bother me. I tried these for breakfast this morning. If blindfolded would I mistake them for real maple sausage patties? No. Would they make a decent stand in for sausage with other ingredients in a breakfast sandwich? I hope so! I ate them by themselves this morning with some hashbrowns, but the next test will be the breakfast sandwich. If you are looking for something with the texture and flavor of real sausage, you are barking up the wrong tree here. I used the recommended cooking method- 10 to 15 minutes in a 350 degree oven. They were soft, but not exactly meat-like. Nuking them is a huge mistake. It hardens them and makes them like wooden hockey pucks. I would buy them again, for the aforementioned breakfast sandwich making, but I won't be eating them by themselves again.